The PI39 from Califone is a powered wireless whiteboard array speaker that provides clear, powerful audio for addressing groups as large as 300 people. 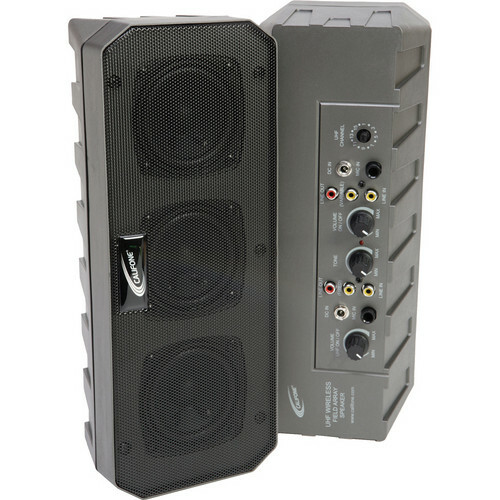 Ideal for presentations, classrooms, meetings, and more, the speaker can be used with LCD projectors, computers, and a variety of media players. The speaker features 3 high-power neodymium speaker elements that provide pro-quality audio in a lightweight and efficient design. The speakers are specially focused to deliver audio directly to your audience, rather than bouncing audio off the walls. The speaker has 1/4" mic inputs and RCA line-level inputs for connecting a variety of audio gear. It also has a 16-channel UHF receiver for use with wireless microphones. Tone controls let you adjust the response of the speaker for your particular application and environment. Line-level outputs let you easily connect additional speakers. The PI39 comes with all necessary wall-mounting hardware for easy installation. Box Dimensions (LxWxH) 14.0 x 10.0 x 7.0"
PI39 Powered Wireless Whiteboard Array Speaker is rated 1.0 out of 5 by 1. How do I connect this to an existing whiteboard? The speaker has 1/4 mic inputs and RCA line-level inputs for connecting a variety of audio gear. It also has a 16-channel UHF receiver for use with wireless microphones. What cables do I need to connect to a Smartboard? It will depend what the output of the Smartboard is. The speaker has both RCA and 1/4 inputs.